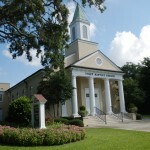 Welcome to First Baptist Church of St Simons Island. You are our honored guest! 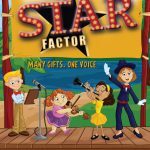 The main lot with guest parking can be accessed from Ocean Blvd or Demere Rd with additional parking across Demere and behind the Christian Life Center, which provides the easiest parking for families with nursery aged children. We hold Sunday worship services at 8:30am and 10:30am with Sunday for all ages occurring from 9:30-10:15am. 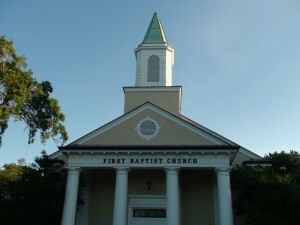 FBCSSI is a family of believers sharing God's love and grace with all people. At FBCSSI you will find a place to experience God through Jesus Christ, grow in faith through meaningful Bible study and prayer, celebrate God's presence in worship, and give hope and healing to those in need all in the context of a loving Christian community. We would be honored if you would join us for worship so that we can get to know you and explore together how we might be a part of your journey with God. Connect with one of our staff to let us know how we can help you or answer any questions you might have. Discover a Sunday School class that is just right for you.